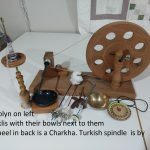 Hey, It’s All About Cotton – in this hands-on class, Karen Bochinski will teach how to spin cotton on several types of spindles and demonstrate spinning cotton. Click on the photo to read more. 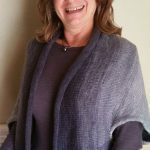 Sheila modeled her Gradient Shrug at the Holiday Luncheon Fashion show and lots of people wanted the pattern. If you would like to make a shrug of your own click on the photo for more information.